Does door-to-door sales still work for pest control companies? 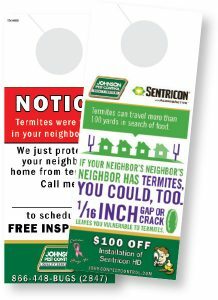 The front and back of a current Johnson Pest Control door hanger. Do the old-fashioned ways of selling, such as using door hangers and fliers — or even knocking on doors — still work? I know a couple of pest management firms that have been so successful at sending out folks to knock on doors that they sold out to large firms, and then did it again. I don’t know the retention numbers on the accounts that were acquired, but the owners were able to sell their businesses at a hefty profit. My good friend Michael Botha, founder and president of Sandwich Isle Pest Solutions in Hawaii, told me a long time ago that one day everyone will sell their business, either to someone in the family or to a larger firm outside of the family. So build and position your business to sell, because someday it will sell. Let’s look at the lowly door hanger, using one of mine (pictured on p. 134) as an example. 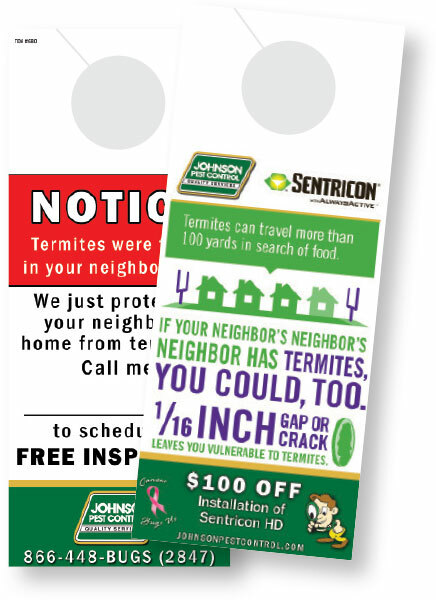 It informs potential customers that we just provided termite protection for one of their neighbors, offers a free inspection, and includes a coupon for a new termite treatment. It’s colorful, professionally laid out and not only looks great, but works great, too. My sales inspectors — and their subsequent sales — tell me so. This company will come to my home. This company is interested in my business. This company will help me solve my problem. People may even feel relieved that they won’t have to search online, filter through dozens of companies and interview several of them to find a great service provider because they just had one come to their door. My door hanger might even lead to them visiting my company’s website (conveniently listed on the door hanger) and reading all the five-star reviews my company has earned. Wow, what service! When I started out, I did a lot of door knocking, hand shaking and baby kissing. I went the extra mile to earn folks’ business. People like great service, with a professional touch, delivered right to their home. They will tell friends, family and the whole world about you if you deliver and keep your promise of doing just what you said you would do. Why not give it a try? I challenge you to come up with not one, but several different door hangers with multiple messages and see what it does for you. If you’d like to share your ideas with me, I’d love to see what you come up with. Until next time, if local regulations allow it, go knock on some doors. Contributor Ray Johnson, a past president of the National Pest Management Association, president of Sevierville, Tenn.-based Johnson Pest Control and founder of ACES for Business, can be reached at ray@johnsonpestcontrol.com.